In my perpetual sales cycle, step two, the second P, is potential. This is where we figure out who are our perfect customers, there may not be one exact type, there may be two, there may be three. I suggest that you start with one, work on that then possibly get a second one, then possibly get a third, don’t go beyond that, let’s concentrate on those. You might say, “Oh, we got loads of different types”, don’t worry about it, that’s fine, just concentrate on the best ones. But not all people are the same and the reason this is good to know, is because it not only tells you what type of voice, what type of approach to use for your customer when you are writing to them, when you are talking to them, it also tells you where to find them, what they might like. So, for example, I’ll give you an example of a flower shop, so who’s your customers? You think well they are men buying presents for their wives, for Valentine’s Day, for their partners, for their girlfriends. Or you wives would probably think, “My husband doesn’t buy me flowers, not since we got married.” So let’s say, men buying flowers for girlfriends they want to impress or only for wives when they’re feeling guilty on their way home from work. But it’s not as simple as that. Of course, women buy flowers as well, not only do women buy flowers for themselves, they buy them for gifts and women might buy flowers for other women, you need to know that. Only you can know. So if you are a windows installer, you perhaps want to advertise. Where do you advertise? Do you just automatically put it in a local paper? How about if you advertise into a certain demographic? If you know your buyers are perhaps the woman in the house rather than the man, for whatever reason, say for example, perhaps then you can figure out where in your local town do women hang out? Is there a female only fitness gym? Can you go and put up an advert in there? Can you sponsor something there? That type of thing, Good to know. Of, course that helps with knowing the age range and all these kinds of things. What else? Let’s say you are an office stationery buyer. Is that the boss of the company? Or is it the buyer, or is it an assistant, or can anyone buy their own? 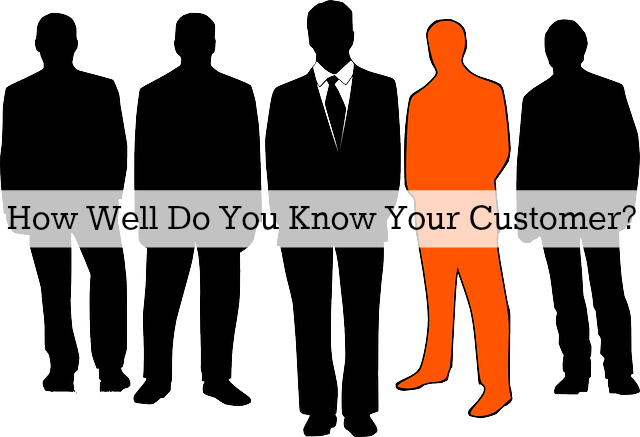 Who is your customer? Do you know? Just think of as many examples you can think of ; fire safety. Things like fire safety signs, fire extinguishers, fire products, fire stopping seals, all that kind of stuff. But we have customers using these products who would be in the building trade. In other areas if they’re buying them for their office. They may be the owner of a very small business, or they may be the building manager of a much larger businesses who is not the owner, who is just middle management or senior management, they may be the buying department of a larger business and. We need to know that. 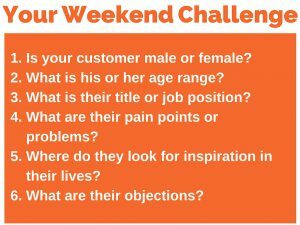 So, let me give you a weekend challenge and let’s figure it out together, these are the six important things you need to know. So this is not as hard as you think, honestly, trust me I am not a doctor. Pen, pad, I assume you’ve already got them ready. 1. Is Your Customer Male or Female? If your customer is 60% male, 40% female, I mean not at the same time, then we are going to say that is predominantly male, okay? Don’t say, we have a bit of both. Yeah, I know you do have a bit of both; we’re looking for the main things. 2. What is His or Her Age Range? Now if you’re looking for age range, look for general age range demographics of that people use. Google “age range demographics”, or “age range questionnaires” and you will see, look at images, Google images, you will see bunch of examples and people say up to 18, 18 to 24, 24 to 34, 35 to 45 and over 55, 65 plus, all that kind of stuff. Figure out that perfect age range. I’ll add a little proviso though with age; age isn’t always as important. It’s important if they are around the year 20 mark, or they are around 60’s and above, but in between, not so much. But you can figure out if they are in their early 40s, then the age of their children is going to be very different to somebody in their late 20s, probably. So you can have it slightly wider, you can figure out that your age range is from 25 to 40, for instance, doesn’t have to be exact, you don’t have to know the exact year. So that was number two. 3. What is Their Title, or Job Position? Now of course, they may not have a job. They may be the domestic engineer, or housewife, or even a househusband. 4. What are Their Pain Points? What are the Problems? So, for instance that man buying flowers on his way home. So the pain points, he’s upset his wife, he’s on his way home, he needs something in a hurry, but he doesn’t have time to get a proper gift. That’s a pain point, so time, speed, convenience, cheap, we’ve all been there. 5. Where Do They Look for Inspiration? And I mean inspiration in their lives. Now something we need to get straight is so for instance, say your demographic is the office manager and you’re looking at a type of business, the person who buys is a person, they are a human, an individual, so we’re looking at the individual. We know their job, we know what they do, but it’s the person that buys. Where do they look for inspiration? Do they Google? Do they use Facebook? Is it clothing based? Are they more of a female demographic; are they on Pinterest or Instagram? Would they ask their friends? Would they Snap Chat a friend? Where do they go for inspiration? Do they go to the library, do they look stuff up, do they watch TV? Do they sit alone at night watching late-night infomercials? Where are they getting it? So, all these things are very important. 6. What are Their Objections? What we mean by that is, what’s their problem? So, their objections may be a high price, it takes too long, it’s a hassle, I don’t like being given delivery charges, it’s too far away, I want to see it, I want to try before I buy it; these types of objections, so you can figure that out. So for instance if you are the installer, people want to know the quality of what they are getting, so you can’t just send them a brochure, because they are spending a lot of money. Someone has got to go to their house and show them what that looks like, for example. This is the kind of conclusion you would come to. With the florist, you would have some simple, convenient pre-packed ones available from 4:30 until 6:30 for guys to buy on their way home, for example. I obviously have no knowledge of the trade whatsoever, but I’m guessing. 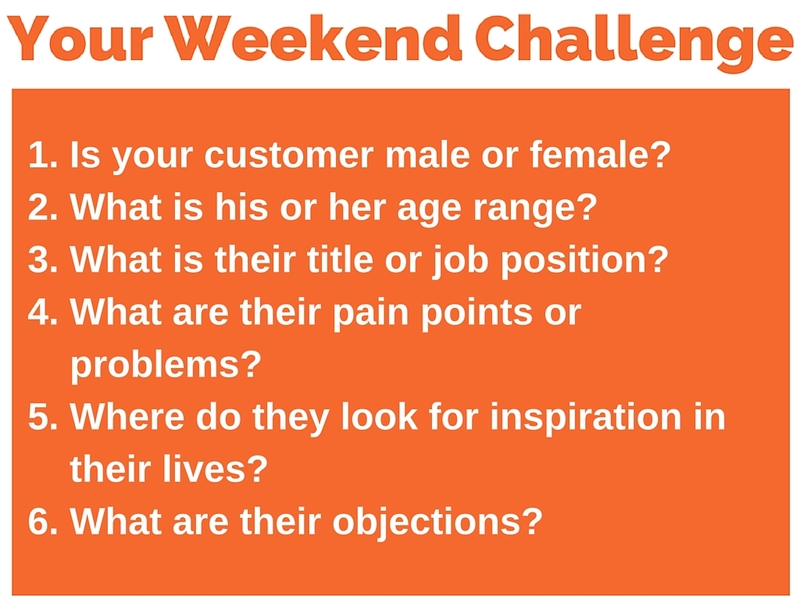 So if you can nail down those six, you can do it over the weekend, that’s good, then you are most of the way to knowing who your customer is and in your products, your marketing and everything else towards them. So if you have a female demographic, would you add a bit of pink in some of the color schemes, maybe a bit more pastel colors? Perhaps unless it’s a like more of a 60/40 split, then you are going to really put off all of the males, if it is 90/10, there are some things, so, think it through, it’s worthwhile. Now these weekend challenges, there’s one every single Friday. So if you go to marketingforowners.com/challenge, you will find every single one is listed there, everyone that I have ever done. The ones at the beginning were a bit short and quick and they are still good, but they were the short and quick. The others are great and a bit longer and are very helpful so try those.